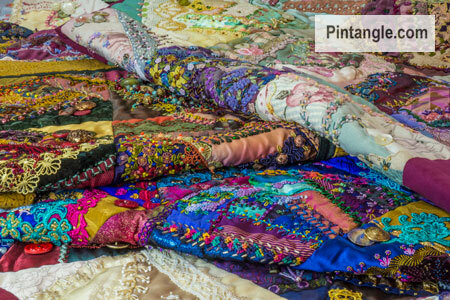 Home Crazy quilting 2020 Crazy quilt Who feels like a humungous delicious stitchers challenge? Feeling like a stitchers challenge? I have decided to propose a challenge/stitch along to make a 2020 quilt. What is a 2020 Quilt? It is a quilt with 2020 different pieces of fabric in it but when you give it a twist and apply it to crazy quilting it becomes 2020 items. At the turn of the millennium many quilters made Y2K quilts with 2000 pieces in them. They are usually charm quilts. Many quilters got the bug me included as I made the I Dropped the Button Box quilt. I loved making it. So I have decided to revisit the idea 20 years on starting now so I have good chance of finishing it by the end of 2020! Since it is large project, made over a long time I am suggesting a stitch along challenge for anyone else who is interested in this project. Starting now means it can be worked at a relaxed pace and a challenge helps to keep things interesting over that period of time. After floating the idea in the two big Facebook groups Crazy Quilt Divas and Crazy Quilt International there was much discussion on what could counted and what not. I have decided to keep the rules simple and flexible as people need to be able to adapt the challenge to their needs and interests. The rules are simple – make your quilt of blocks that are any shape or size. The quilt has to be made of 2020 unique items or pieces. The aim is to finish by the end of 2020 to mark the year 2020. Now down to the nitty gritty …Those unique items can be fabric, lace, braid, ribbons, doilies, hankies, buttons, charms, and beads. When this was discussed on Facebook counting types of seed beads and bugle beads was raised. For instance if you had green seed beads then some purple seed beads on a block that would be 2 ‘items’ ie. 1 for the green and 1 for the purple. I think many people who enjoy beading and want to push their skills in that direction will be happy to know that. You can also count embroidery and embroidery techniques as an ‘item’. For instance you can aim to have certain number of embroidered seams that are stitches combined in different ways. Or you may want to create stitched motifs and designs that are all different! In this type of instance creating each ‘item’ in a unique manner is the challenge. Or it could be a combination of different items such as buttons fabrics etc and different embellishment techniques. In other words what you count as part of your 2020 items and how you count them is up to you. Variety is the name of the game here. Start anytime you like. We have a good 3 and half years to do this so if you are currently committed to projects carry on stitching and when the time is right join in. Of course the idea is to share what you do along the way. Remember sharing photos of what you is not bragging but giving back to the community. Sharing helps inspire and stimulates everyone in the group. Having a strong active group means everyone is encouraged, new hands can ask questions and we can all share ideas. On a big project like this, being part of a group will keep things interesting. Support and stimulation of a group hopefully means the idea wont become a huge UFO either! Where to Share : Admins on the two big Facebook groups Crazy Quilt Divas and Crazy Quilt International are more than happy for people to share there work there. For those who have blogs you can leave your web addy in the comments. Instagram people can use #2020crazyquilt to share progress photos. Tomorrow I will share with you how I have been planing and organising the project. Meanwhile, let me know what you think. Share the news and let people know about the challenge. Leave a comment here or on Facebook to let me know what you think, ask questions etc I think this will be fun! Sharon, I just received your book today…The visual guide to Crazy Quilting design. Couldn’t put it down….ready to get started on the 2020 challenge, even though it is very late. One question, does the quilt have to be a real quilt or could it be several different panels, and will each piece of different lace or trim count as a separate piece for the count even if they came from the same wedding gown? Thank you and I am looking forward to this so very much even though I have only made one small crazy quilt piece years ago. When did this challenge begin? It’s the end of 2018 now, and I’m wondering if it’s too late to begin? Also, how large are the hexagons you are making for this? I have been following you for a long time. I have spent so much time on regular quilting that my interest in crazy quilting hasn’t really developed. I would like to join this effort and plan to get more serious with embroidery stitches and cq block design. Thanks for providing the forum. I just came back from the Camino de Santiago and this is a great project to start being creative again. Thanks Sharon for introducing the Camino to me. My husband and I walked all the way to the end of the world. I am sure this 2020 project is going to be a great project. Can’t wait to start. I’m planning on using alot of cutter linens for this project! They should make a great canvas for the stitches. I have a crazy quilt I bought at an antique shop. The top is done, but there was never any embroidery added. This would be a wonderful way to get me working on finishing it. Guess I need to pull out the art journal and think about how to tackle the 2020 items! Thanks for introducing this project and the Camino de Santiago to me. I think this project is going to be as good as the Camino. We finished the Camino 3 weeks ago so I am ready to start a new project. Joining in, need reasons to rebuild my stash! Will be doing a wall sized quilt for over my bed, limited color palette! I’m not sure I can commit to this, but my mind keeps turning to how I would do it. Without any encouragement from me, my body found its way into my sewing room and began counting how many different fabrics I could find. Found 267 so far. I guess (at this stage) that means I’m in. Diane I think your subconscious is trying to tell you something … and I am not talking about chocolate. My book came earlier this week and it is a beauty and full of good stuff for crazy quilts. I want to do this. I have been wanting to make a crazy quilt out of my mother’s wedding dress. I’ll try 2020 different embroidery stitches. I have never done a crazy quilt before. So I better get the dress into the Oxiclean. I’d like to join. I need a challenge. I haven’t really quilted for a couple of years due to some family issues and I’m having a hard time getting back in the groove. Sounds amazing…would.like to give it a shot! I would love to start this project – it will go along with the 147 other projects I have on the go. When our guild did crazy quilting I really enjoyed it so this should be good for me. I am looking forward to your book and I have boxes of fabrics, beads and old laces. I am wondering about using natural colours and old tablecloths, napkins, laces etc. However, it might limit me too much. I just think something subtle might be nice. Will have to see just how much I have. Lots of old lace, buttons etc but not sure how many fabrics although I also have silks that could be included. Thanks for the inspiration – another project to be thinking about. Oh my, what a great idea. I have been learning embroidery for a couple of years, and beading too, so I have loads of class ‘mini projects’ that are useful as a resource but will never get finished as a thing in their own right, but this would be a delightful use for them. I always feel so bad when I have ufos lying around, and I can’t bring myself to bin them or undo them. I have never quilted, but have a massive stash of fabrics and trimmings from my years of dressmaking. I retire in the middle of next year, so I will start the quilt in earnest then, but I am certainly going to repurpose all of my existing and new ufos in the meantime for this. I gues I next need to buy your book to make it happen too. Thank you. I got linked here from the Inspirations Facebook pages, and I will sign up to follow you too. Karen thanks for letting me know Inspirations mag has linked to me that made my day as I was unaware they had! Your point about using UFO is very appropriate as it is great way to use them up and include them in a larger projects. Also it means you get to see the project in your quilt and be reminded of the technique. Many a time I have stumbled across a workshop sample and thought I must do more of that. But if some in incorporated in crazy quilting I usually include even more of that technique – in other words the reminder prompts me to push my skills a little more. I have already started an Alphabet crazy quilt but haven’t got to far with it as yet. The only complete bits really are the embroidered Alphabet middle pieces, that took a couple of years! I have only chosen about 12 different fabrics, so hopefully I can reach the 2020 mark. I applaud the idea and share everyone’s enthusiasm, but in 2020 I become an octogenarian and seriously doubt my energy level can keep pace. I’ll do what I can and cheer everyone else on. I can give back by sharing stash, so I’ll start making squishies. Sharon, your book is on its way to me. I consider it a highlight to your years of selfless and dedicated mentoring to all of us. Sounds like the kind of project I will join in as I know I’m not going to live to be 300 so my motto is use it up clean it up and to not leave a lot of stuff behind me. What a wonderful idea. I am working putting together the blocks of my 2nd CQ and am ready to begin a 3rd. I will be 78 in a week so will begin then and I surely do need a new hand sewing – evening project. Inspiration is always the best thing ever. I don’t have Facebook so hopefully this site will have all your info. Thanks and “Happy trails to all”……..
Well, just in time for my first retirement project! I will join in September, when I am a happy retiree. Can’t wait to have fun! I am up for this and have shared the idea at my quilt group and On my stitch group Virtual Threads and have quite a few members from each group who are going to take part. Cann’t wait for more details. Sounds like fun…will motivate me for a “big” project I have in mind…and I am sure I can get it down in that time frame!!!! already on the email list, and the fb sites, so will be watching progress, and will post pics as I get going!!! I really want to join in…..(jumping up and down with joy)…..One question…..Can blocks that I made a couple years ago count for this challenge? I’ve posted all the info and links at my blog, Food for Thought. Have a great day! I’m in on this one. This sounds great and I’m in. I am retiring at the end of the month and this sounds like a great project to do in my new house in my new town in my new life. Hi Sharon What a wonderful idea. I am already planning my quilt. I thought I would collect 100 pieces of fabric, threads and laces etc just to see the variety of materials I already have. Then spread them all out and see what inspiration comes to me and go on from there. I love it 2020 is my 50th Birthday year SO all I want to know is where do I sign up?? No need to sign up just join in – we will have to hold birthday parties at this rate! je suis partante, je suis arrivé au 96 éme carré de la courte-pointe boutons et n’avais pas encore prévu d’autre projet, je suis ravi que celui-ci arrive à point. I know we have the freedom to do any shape/any size blocks that we like, but are you going to put up the templates of the blocks you make ( as in your Button Box quilt) to give us ideas, or perhaps use as a starting point? Great idea BTW, but I am really bad at sticking to a project. I am so tempted!! Hi Rosemary yes I will be diagramming out the blocks as I stitch and covering the stitches etc that I use and of course people have the button box patterns to draw on too. What a fabulous challenge Sharon. Always wanted to make a crazy quilt and it looks like it’s finally going to take shape. I have been getting your postings for a while now, just need to get started. I really, really want to have a go. Could you send me links to the 2 Facebook groups, which I am sure would be another helpful source of information. 2020 – that’s a lot of items. If you want to include buttons, lace etc don’t forget jumble sales and charity shops and remnant bins in fabric shops and SWAPPING with friends and acquaintances. Ruth I am sure on the facebook groups swaps will happen! This is a great idea. 2020 will be my 60th year so it can be my birthday present to myself! sounds like fun. i am in!! I can’t wait to start. I don’t think I have 2020 items, so it’s an excuse to go shopping!!! I like the way you think – I am trying to find an excuse! I would love to be part of this. Sounds fun I will need to get your book Sharon can’t wait. What a great idea! Love the fact that we don’t have to rush like crazy to get this done!!! I’m in. My mind has been on overload since you announced your idea to do this. Just finished wrapping all my trim (not lace) on cards so that will count for at least 140 Items! Spreadsheet is in the works. Let the party begin! Thanks Sharon for the Challenge! I like your ide of a spread sheet…thanks..
I’ve been saving scraps of my late mother in law’s stash (I made her children/grandchildren each a quilt from her – 29 so far.) specifically to make a crazy quilt. This is a perfect opportunity to start. I also have her buttons and floss and bits of lace. I could get very excited!!! I would love to try this! I received your book yesterday and it’s a beautiful motivator! This is the perfect project to really dig into all the information and the gorgeous photographs you present. Thank you for putting it all together! Will have to study rules a bit but will likely want to do this. Love crazy stitching! I’ve been wanting to make a crazy quilt for years. This is the challenge I’ve needed to get started. Yep, would like to try this. What an awesome idea! I “started” a crazy quilt over 5 years ago…..didn’t get very far at all. This group will be a great motivator! Excited to do this. I’ve been wanting to do a crazy quilt in hexagons so this will be the perfect challenge. I, too second Carole’s “thank you for being there to teach us.” Sharon – all these years I have learned stitching and crazy quilting from your site. You (and your “followers”) have been the greatest of encouragers. Thank you, thank you! this sounds wonderful…and do-able, since others will be encouraging us all along. Thank you for doing this! I am just overjoyed that it will be through pintangle!!! Have wanted to do something like this all these years after studying and admiring the I Dropped the Button Box quilt of yours. I think I would like to try the crazy quilting for the 2020 challenge. I just got your new book and have read the 1st chapter on fabrics. This is new for me but it would be a lot of fun. What size blocks are recommended? And can I do machine embroidery? Sharon, I’m up for the challenge, at least to start it sometime, lol. Can you tell me the finished side of the hexagons you will be making instead of across? That’s the way my brain tries to work here in the US…and is your 7 inches the longer or shorter across of a hexagon? I’ve wanted to do both a crazy quilt and a pieced hexie quilt for ages…combining the 2 will take one thing off the bucket list! Thank you for spearheading this project! Please can you clarify something for me. Sharon? If I use an item of frabic more than once or repeat a stitch on different blocks, is that counted as ONE? A wonderful idea! I will need to plan and work accordingly. I am not a crazy quilter but this might be a good challenge to try. HI Carolyn you can adjust the challenge accordingly – to fit your needs/skills/interests I would love to see what you do with it! Sounds like fun; hope I can do this. I retire tomorrow from teaching Ese kids and adults for 42 years. This sounds like a great way to keep me busy! It will keep you busy for sure Margo! This sounds like fun. Your new book arrived today and it’s absolutely gorgeous! Can’t wait to explore it in depth. Thank you for being here to teach us. Wonderful idea and inspiration to combine two forms of art.